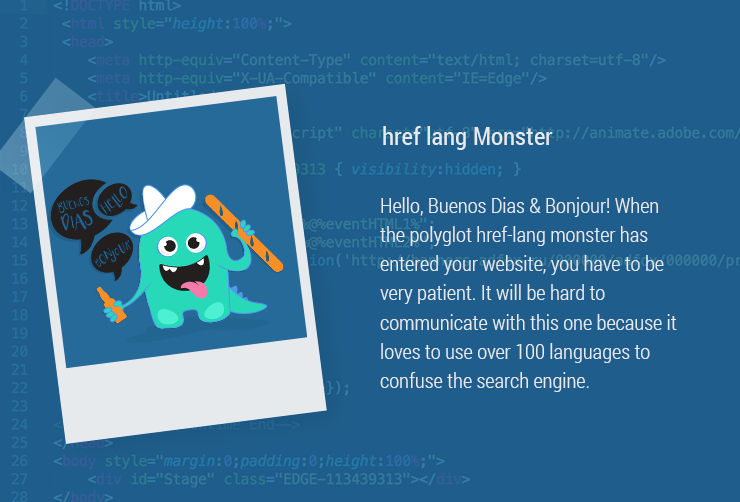 In this article, we’ll show you how you can fight off the polyglot hreflang monster - the final article in our series the website optimization monsters . The offer of many websites is interesting for target groups all over the world, and exists in various country versions. Previously, webmasters were content with storing the attribute “lang” in the code for the corresponding language version. Today, search engines understand most languages if sufficient text is available. What the web crawler, however, cannot understand, is the user group being appealed to. Here, the hreflang monster strikes and the Googlebot is giving you the run-around. Thus, users will not be able to find what they are looking for and webmasters will unconsciously generate a large amount of duplicate content. If, for example, a rental car company makes the German-language version available with identical content on several URLs for the DACH region, the country sites can mutually “cannibalize” each other with the top level domains .de, .at. and .ch and compete with each other in the rankings. If you operate an online shop and want to sell goods to German-speaking customers in Switzerland, in Austria, and in Germany, you should communicate to Google via geotargeting which contents are relevant for which target group. Adjust your content to the language and culture of your target group, including currency, time zone, and the spelling of contact data. If you want to create an international site, you should first decide on a suitable directory structure. If your website contains country-specific sub-domains (e.g. de.beispielseite.com) or directories (www.beispielseite.com/de/), you should set your geographical target in the Google Search Console. You can create the hreflang markup with the help of a hreflang generator for your German-language websites. When you use the attributes, you are signaling to Google that you have created an international website architecture for content in several language versions. In this way, the Googlebot can deliver the appropriate search results to each target group. Each user can decide on the desired Google language. You can monitor how the hreflang monster is residing on your website with the help of Ryte. In the Ryte module, if you click on the menu point “Multilingual Settings” and then on “Languages,” all the translations of your website will be listed. In the subpoint “Status Codes,” you can check whether the translated sites are being forwarded to and whether they are reachable. All status codes that your server gives for sites with hreflang are shown. Figure 3: Allow status codes to be displayed by sites with hreflang attributes. With the hreflang attribute, webmasters can convey the language and country-specific version of international websites to the search engines, thus preventing duplicate content. Search engines read the location information in the attribute to deliver search results in the desired language and country versions. This can lower the bounce rate and increase dwell time, because the searcher does not have to select the proper language version. With the translated contents, you have the same chance as domestic competitors to rank in foreign-language search results lists. Published on 07/18/2017 by Eva Wagner.